Here are my less-than-impressive pictures of the Antares rocket launch out of Wallops Island, Virginia, on April 21, 2013. Taken from the promenade along Beach Avenue in Cape May, NJ, looking south. The residue of the rocket's smoke trail is visible as a faint squiggle in the band of blue sky above the couple on the beach (about 5° above the horizon). Taken at 5:03 pm EDT, several minutes (and too late) after launch because I was erroneously looking about 15 degrees too far to the left, and initially, the pine tree was blocking the view somewhat (until I took a few steps to the left). A minute or two later, the smoke trail had completely disappeared. Canon EOS 6D digital SLR camera (on a fixed tripod) and a Canon 24-105 mm f/4L USM zoom lens at 50 mm focal length; exposed 1/320 second at f/11, ISO 100, in fully automatic mode. The image below was taken a moment later with the same camera and lens, but set to 105 mm focal length; exposed 1/500 at f/9, ISO 100. Here's a nice recap of the launch from The Space Review. Looking east towards the East Point Lighthouse on April 20, 2013, after that day's Antares launch was scrubbed due to high-altitude winds. The vegetation around the lighthouse appears to have suffered from last year's Hurricane Sandy. Taken at 5:44 pm with a Canon EOS 6D digital SLR camera and a Sigma 14 mm f/2.8 lens (Nikon mount with a Fotodiox adapter). Exposed 1/250 second at f/8, ISO 100. This lens yields a 114° diagonal field of view with the 6D's "full-frame" sensor. On Sunday evening, April 14, 2013, the crescent moon was just 3½° from the planet Jupiter when this image was captured at 8:50 pm EDT from Maple Shade, NJ, through increasing cloudiness. Taken with a Canon EOS 6D digital SLR camera and a Canon 70 to 200 mm f/2.8L USM zoom lens (on a fixed tripod) set to 200 mm focal length. Exposed 1/10 second at f/5.6, ISO 1600. On Saturday evening, April 13, 2013, a few of us went to the Tatem Observatory at Camp Ockanickon in Medford, NJ, for the monthly open house. The western sky was lovely during twilight, punctuated by bright Jupiter about 10° from the crescent moon filled with earthshine (mouseover for labels). This image was captured at 8:24 pm EDT, 48 minutes after sunset, with a Canon EOS 6D digital SLR camera (on a fixed tripod) and a Canon 24 to 105 mm f/4L IS USM zoom lens set to 24 mm focal length. Exposed 0.8 seconds at f/5.6, ISO 3200. Here's a picture of Bernie Hosko at Tatem that night. On April 2, 2013, at 5:25 am EDT, M31, the Great Galaxy in Andromeda (the diffuse object on the left) was a little less than 4° from Comet C/2011 L4 (PANSTARRS) near the end of nautical twilight when this image was captured from Atsion in Wharton State Forest, NJ, with a Canon 6D digital SLR camera and a Canon 70 to 200 mm f/2.8L zoom lens (on a fixed tripod) set to 200 mm focal length. This is a single frame exposed 4 seconds at f/4, ISO 4000. Click here for a picture of the pair on March 30, 2013. On April 4, 2013, the comet and M31 were observed visually at Atsion during their closest approach. While there, I did a binocular mini Messier Marathon between 4:45 and 5:45 am EDT; twenty-five objects were found. On March 19, 2013, at 8:08 pm EDT, comet C/2011 L4 (PANSTARRS) was at 7.5° altitude near the end of nautical twilight when this image was captured from Maple Shade, NJ, with a Canon 6D digital SLR camera and a Canon 70 to 200 mm f/2.8L zoom lens (on a fixed tripod) set to 108 mm focal length (then cropped). Exposed 1 second at f/4, ISO 1600. A couple of stars are visible too. 52 Piscium (mag 5.4) is above-right of the comet and below-right of it is 47 Piscium (mag 5.0). Click here for a larger version. At 7:54 pm EDT on March 12, 2013, comet C/2011 L4 (PANSTARRS) was just 4.5° from the young crescent moon (28 hr 03 min old and 1.7% illuminated) as viewed from East Point, NJ, at the mouth of the Maurice River overlooking the Delaware Bay. At the time, 50 minutes after sunset, the moon and the comet were at 3.6° and 4.4° altitude respectively. Taken with a Canon EOS 6D digital SLR camera and a Canon 70 to 200 mm f/2.8L zoom lens (on a fixed tripod) set to 200 mm focal length. Exposed 0.8 seconds at f/4.5, ISO 1600. Click here for a larger version. The first sighting of the year on 01-Feb-2013 was actually accomplished with an 80 mm, f/6 apo refractor and a 35 mm Panoptic eyepiece (14x, 4.6° field). As prompted by this Sky & Telescope online article, I will continue to follow the current apparition with the 80 mm scope, watching as Mercury increments from a nearly-full gibbous phase to a thin crescent. Unfortunately, the seeing on this blustery evening was dreadful, so no real shape of the 94% illuminated, 5.2" diameter disc was detected with a 10 mm Radian eyepiece (48x). The evenings of 02-Feb and 03-Feb were cloudy, but it was clear after sunset on 04-Feb-2013, so I was back at the Maple Shade baseball field complex with the 80 mm refractor. On arrival, Mercury was spotted with 16x70 binoculars at 5:48 pm EST. A few minutes later, Mercury was spotted with the scope, and then Mars, about 3½ degrees higher in the same field of view, with a 40 mm eyepiece (12x, 5.2° field). With a Nagler 3-6 mm zoom eyepiece at 6 mm (80x), both showed discs, but no perceptible phases (Mercury was 89% illuminated and Mars 99%). Mars was generally a ruddy color, but Mercury was whitish with distinct atmospheric chromatic aberration. 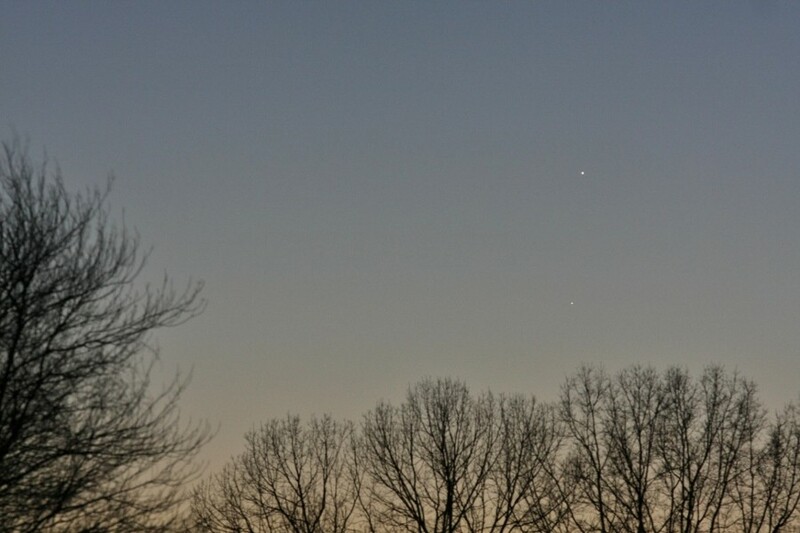 At 5:58 pm, I was able to spot Mercury with unaided eyes, but not Mars (they were magnitude -1.1 and +1.2 respectively). Unlike 01-Feb, seeing was pretty good; Rigel and Castor were split without difficulty using the 80 mm refractor and the Nagler zoom at 6 mm. It was cloudy again on 05-Feb, but clear on 06-Feb-2013, so both Mercury and Mars fit comfortably in the same field of the 80 mm refractor with a William Optics 25 mm SWAN eyepiece (19x, 3.8° field) around 6 pm EST. Seeing was too poor to reveal the gibbous disc of Mercury and there was again significant atmospheric chromatic aberration. Mercury, but not Mars, was visible to the unaided eye, but both were visible photographically (see the image above). It was cloudy on 07-Feb and 08-Feb, but quite clear on 9-Feb-2013 when the two planets switched positions vertically (image above). Mercury was an easy object for the unaided eye, and in the 80 mm scope at 80x, a vague non-circularity was evident. Mercury was seen again from Sunset Beach near Cape May, NJ, on 10-Feb-2013, but a cloud bank along the western horizon obscured Mars. Clouds prevailed on 11-Feb. Mercury was again easy to sight with unaided eyes under clear skies on 12-Feb-2013 from the Maple Shade baseball field complex at 6:25 pm. With the 80 mm scope at 160x, Mercury looked distinctly oblate (it was about 67% illuminated). On 13-Feb, it was cloudy. On 14-Feb-2013 at the baseball fields, Mercury clearly looked about half illuminated, with a slightly convex terminator, in the 80 mm scope at 160x (it was 59% illuminated). Again, it was easily seen with unaided eyes; Mars was visible with 10x42 binoculars. On 15-Feb-2013 at Atsion Field, Mercury was spotted with 10x42 binoculars, and then easily seen with unaided eyes. On 16-Feb-2013, the day of Greatest Eastern Elongation, it was cloudy, and it was cloudy along the western horizon after sunset on 17-Feb.
On 18-Feb-2013 at the baseball fields with the 80 mm scope at 160x, Mercury's terminator looked slightly concave, i.e., Mercury was now a crescent (it was 41% illuminated). The disc was 7.6" diameter. It was cloudy on Feb 19. On 20-Feb-2013, seeing was terrible after sunset and in the scope, Mercury was just a horizontally elongated blob (31% illuminated, 8.1" diameter). It was visible to the unaided eye in clear skies, but dimmer than before (now magnitude +0.2). Again, Mars was not found, in binoculars or the scope. On 21-Feb-2013, seeing was terrible again after sunset and Mercury was only a vague crescent in the scope. However, it was quite clear, so magnitude 0.5 Mercury was easy to see with unaided eyes in darker twilight (even through the car's windshield on the way home from the ball field). Mars was spotted in the scope at 30x, then subsequently seen with 16x70 binoculars (but not with unaided eyes). When first spotted 5° below Mercury at 6:20 pm EST, Mars was at magnitude 1.2, 4° altitude and 12° solar elongation. On 22 and 23-Feb at the baseball field, it was cloudy. On 24-Feb-2013, clouds cleared away from the western horizon after sunset and Mercury was spotted in 16x70 binoculars, but was not seen with the unaided eye (it was down to magnitude +1.5). In the 80 mm scope, poor seeing yielded just a horizontal blob for the 15% illuminated crescent. Mars was not seen, even with optical aid. On 25-Feb-2013, there was a narrow band of clearing along the western horizon after sunset. Mars was spotted first at 6:15 pm EST with the 80 mm telescope, then Mercury at 6:20 pm. Mars was at magnitude +1.2 while Mercury was magnitude +2.0 (just 11% illuminated) and it was not visible to the unaided eye. Seeing was mediocre, so at 160x, Mercury at best looked like a blurry horizontal banana. With Mercury's magnitude now dropping sharply as it approaches inferior conjunction on March 4th, this may be the final sighting for this elongation. On 26, 27 and 28-Feb, it was cloudy, which wraps it up until the upcoming western elongation in the morning twilight beginning in the middle of March. On February 15, 2013, the asteroid 2012 DA14 will pass rapidly by the earth at close range. It will be nearest at 2:24 pm EST, within 18,000 miles of the earth's surface (closer than the ring of geostationary satellites), but that time won't be favorable for those of us on the east coast of the United States. At it's closest, DA14 will be brighter than 8th magnitude and the apparent motion will be almost 1 degree, or two moon diameters, per minute. 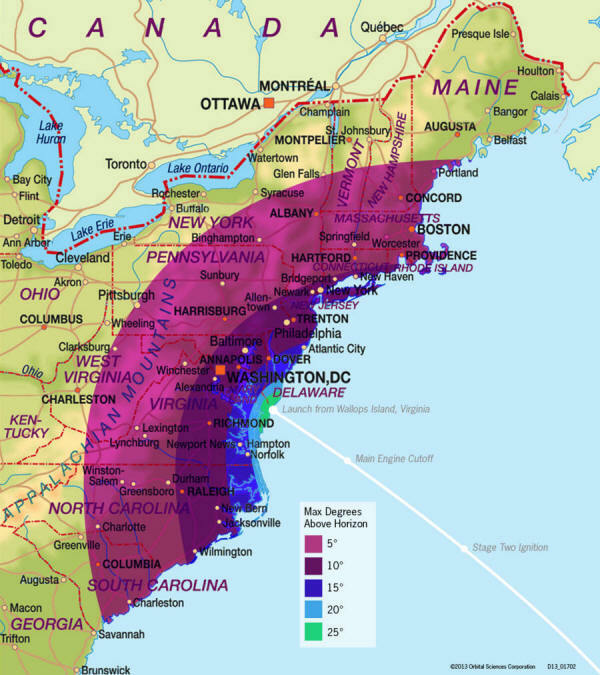 By 7:00 pm, towards the end of astronomical twilight in New Jersey, it will be fainter than 11th magnitude and moving about 1/12th degree per minute (or 1/6th of a moon diameter per minute). The SkyTools chart above shows DA14's position near the North Celestial Pole at hourly intervals on the 15th for an observer located at 40°N, 75°W. The positions were manually inserted from an ephemeris generated by the Minor Planet Center (Note: the ephemeris and chart were updated on February 12, 2013). The background sky is set for 7:00 pm EST and should be rotated clockwise for times before 7:00 pm and counterclockwise for times after 7:00 pm. More information about this near-earth asteroid pass is available from Sky & Telescope and NASA. Weather permitting, I plan to manually find and track 2012 DA14 with my 12.5-inch Newtonian-Dobsonian telescope. It will be similar in brightness and apparent motion to the near-earth asteroid 2005 YU55 that was spotted and tracked with that scope on November 8, 2011. Linked below are black-on-white finder charts (in PDF format) suitable for print-out. They show the MPC ephrmeris points from the chart above along with the track generated by SkyTools 3 (using a special element set to compensate for near-earth perturbation; the track agrees well with the MPC positions). The circle at the center of each chart is 1.4° in diameter, the field of view of a 35 mm Panoptic eyepiece in my 12.5-inch telescope. The angular size of the circle remains constant even though the size on the chart increases as the field size of the charts decreases (the angular field dimensions are given at the bottom-right corner of each chart). The first chart (wider field) has a limiting magnitude of 10; the second 11.5, the rest 12.5. This resulted in a higher density of stars than I might normally have on a chart, but I wanted to maximize the potential reference points for this fast-moving asteroid. Note: From 7 to 9 pm, the position on the SkyTools track trails the MPC position by about 4½ arc minutes; at 10 pm, it's about 4 arc minutes; between 11 pm and 1 am, about 3 arc minutes. This level of uncertainty should not present a problem locating DA14 with a low to medium power eyepiece. Update: On the evening of February 15, 2013, the asteroid 2012 DA14 was successfully spotted at 7:15 pm from Atsion Field with my 12.5-inch telescope and then tracked for an hour (the SkyTools charts proved quite accurate). Motion was evident in real time at 160x, and became obvious when the asteroid passed close to a star. After 8:15 pm, clouds started rolling in, and by 8:30 pm, it was completely overcast. On February 12, 2013, the Crescent Moon joined Mercury and Mars. Mercury is just above the cloud band, almost directly up from the cell phone tower. Mars is to the left of the tower top (mouseover to see a crop of the sky near the tower; magnitude 3.8 Lambda Aquarii is to the left of Mercury). Taken at 6:15 pm from the Maple Shade, NJ, baseball field complex with a Canon 40D digital SLR camera (on a fixed tripod) and a Sigma 18-50 mm f/2.8 zoom lens set to 50 mm focal length. Exposed 2 seconds at f/5.6, ISO 400. At 6:10 pm EST on February 6, 2013, Mercury was at 4° altitude and 1.6° below Mars when this picture was taken 45 minutes after sunset from the baseball field complex in Maple Shade, NJ. The two planets will be at conjunction on February 8th at 4 pm when Mercury passes 0.3° north of Mars (see this Sky & Telescope article). Captured with a Canon 40D digital SLR camera and a Canon 70 to 200 mm f/2.8L zoom lens (on a fixed tripod) set to 200 mm focal length; exposed 1 second at f/6.3, ISO 800. Mouseover for labels. 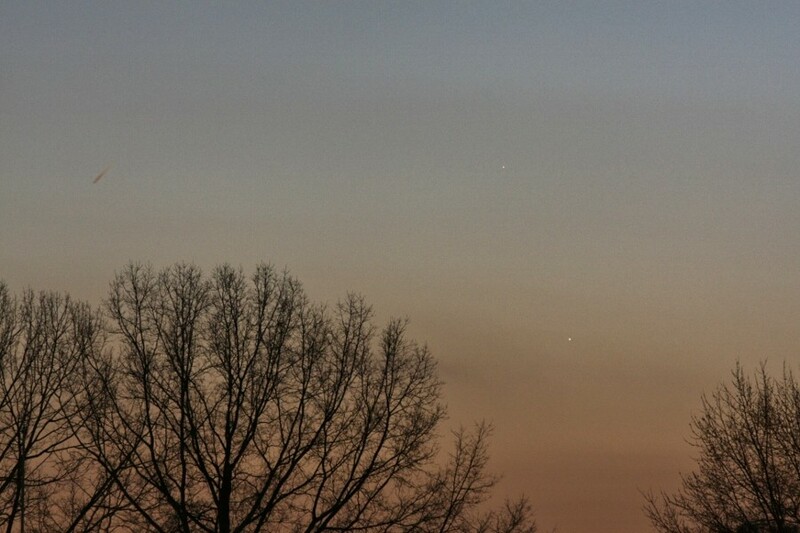 On February 9, 2013, after two nights of cloudy weather, Mercury was at 6½° altitude and 1.1° above Mars at 6:11 pm EST when this picture was taken 49 minutes after sunset from the baseball field complex in Maple Shade, NJ. Captured with a Canon 40D digital SLR camera and a Canon 70 to 200 mm f/2.8L zoom lens (on a fixed tripod) set to 200 mm focal length; exposed 1/4 second at f/5.6, ISO 800. Mouseover for labels. On January 21, 2013, Jupiter was 2½ degrees from the gibbous moon at 4:40 pm EST (26 minutes before sunset at 5:06 pm) when this picture was taken from Maple Shade, NJ, with a Canon 40D digital SLR camera and a Canon 70 to 200 mm f/2.8L zoom lens (on a fixed tripod) at 200 mm focal length, then cropped to two-thirds the original size for an apparent 300 mm focal length. This single frame was exposed 1/640 second at f/5.6, ISO 400. Mouseover to label Jupiter. Later in the evening on January 21, 2013, the closest approach between Jupiter and the moon was at 10:59 pm EST. The picture above was captured at 10:48 pm, when Jupiter was 35 arc minutes from the lunar limb, with the same equipment and focal length as the picture above. This is a single frame exposed 1/500 second at f/5.6, ISO 400, in monochrome mode. Mouseover for a crop of one-third the original size (as if it were 600 mm focal length). At 4:40 pm, Jupiter was at 41° altitude in the east; by 10:48 pm, it had swung around the sky and was at 52° altitude in the west-southwest. In the interim, an inch of snow fell. On January 12, 2013, the crescent moon was just 27.0 hours old, 1.8% illuminated and 6° altitude at 5:44 pm EST when this image was captured from the baseball field complex in Maple Shade, NJ, using a Canon 40D digital SLR camera with Canon 70 to 200 mm f/2.8L zoom lens (on a fixed tripod) set to 100 mm focal length. Exposed 1.6 seconds at f/5.6, ISO 800. The planet Mars, at a relatively dim magnitude 1.2, is near the upper-left corner of the frame, about 8.5 degrees from the moon (mouseover for labels). Mars will reach solar conjunction on April 17, 2013 (EDT), when the sun catches up to it in their eastbound chase. A minute later, at 5:45 pm, the moon was imaged with the same setup, except at 200 mm focal length (so Mars is no longer in the field of view). Exposed 2 seconds at f/5.6, ISO 800.